One of the biggest issues the construction industry faces is a labor shortage. When you find skilled candidates, you must move quickly. Backgrounds Online expedites this process. We confirm the applicant’s identity immediately, check education, employment and references promptly, and give you the fastest turnaround time possible. Rely on our dedicated team for accurate reports that help ensure you don’t miss out on qualified candidates. Depending on the type of worker you’re hiring, they may be required to hold a specific type of license. This might relate to a particular skill that will be used on the job or a class of license that allows them to operate heavy machinery. Our team verifies licenses so you will know for sure if a candidate has the skills and authorization to handle all their on-the-job duties. Prior to extending an offer, you may wish to check a person’s history for criminal records. This is done to see if the candidate has something in their history that could negatively impact your business. Backgrounds Online offers a wide assortment of criminal background check services. We’ll help you find records that were filed at local, state or federal courts. Run a complete criminal screen to protect your business, assets and other employees. It is imperative to make sure your background screening and hiring practices are compliant with federal and state laws. Regulations vary from location to location, so it's important to be aware of laws that govern any city or state in which you are hiring. It's beneficial to document your hiring and screening procedures and use them as a guideline whenever you're looking for new employees. It's also important to maintain strict and fair hiring guidelines so that every applicant goes through a similar screening process. The specialists at Backgrounds Online are industry educated and FCRA certified. We can help put together screening packages for every type of position. Save your custom screening packages and re-use them every time you're hiring. Do I need to run background checks for temporary workers? A: It is legal to hire people without running background checks, but doing so creates a lot of unnecessary risks. Construction workers are often required to have specific licenses, training and experience. Many people pad their resumes to make it look like they are qualified even if they are not. A background check is the best way to confirm a person's history so you can be certain you're hiring people who are eligible and prepared for the job. There are numerous laws governing how criminal records can be used for background screening, and they vary by location. It is important to see if a candidate has a record that might make them ineligible to work for your company, but you must remain fully compliant while doing so. 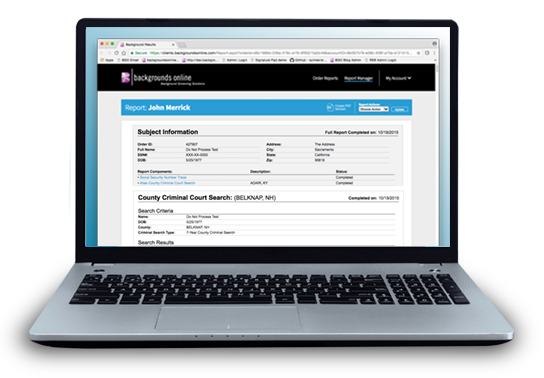 Backgrounds Online offers a suite of criminal checks that show you what you need to know about any candidate, and we have the knowledge and skills to ensure compliancy throughout. I hire workers for multiple sites in different cities. Can you offer convenient drug screening for all of my applicants? A: Yes. Backgrounds Online has a partnership with Quest Diagnostics. Together, we offer 5, 10 and 14 panel drug screening services throughout the United States. Our team will help you determine the most convenient locations for every applicant or current employee you need to have screened. I'm hiring people who will drive on the job. Can I check their driving records annually? A: Yes, and we recommend doing so. Construction workers are frequently called upon to drive company vehicles, and they often transport company property and even other workers. Annual background reports with a Motor Vehicle Record Search show you if a person had a new ticket, accident or violation during the previous year, so you can review their ongoing eligibility for the job. Should I get background checks for administrative workers? A: We recommend screening all of your employees. This helps you find qualified people for any type of job, and encourages fair hiring practices. Background checks are used to verify a candidate's identity, show you if an applicant has criminal records you should be aware of, and confirm a person is eligible for a specific job. If you have more questions about how a background check can help you build a reliable team, then please contact us. When you work in the construction industry, safety is a top priority. This starts with the hiring and screening process, and continues until each job is complete.